Plated alongside the Cornish Game Hens were these vegetables. A splendid addition to a grilled dinner. Scallions make a fine plate presenter, but leave a lot to the taste. Next time I suggest you try grilling Leeks. 1. Cut the Zucchinis into 3/8″ slices, add to a flat deep sided platter. 2. Coat with the EVOO & allow to marinate for at least 1 hour or more. 3. 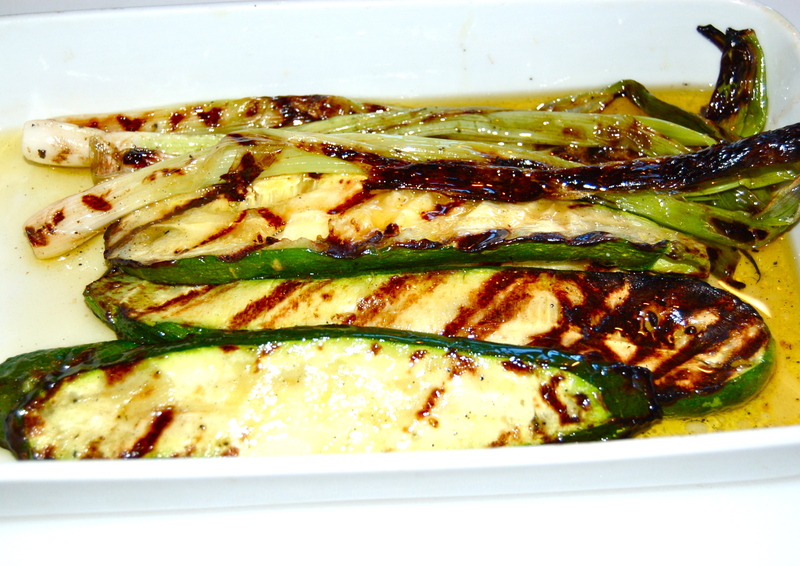 With the grill still on, add the Zucchinis & grill for 5 minutes, turn & repeat. Watch them carefully if 5 minutes a side is too long reduce to 4 minutes. You do want them to be very tender. Remove to the marinating platter. Note: If grilling Leeks which I’ve yet to do, I suggest looking up a recipe. Google is a good source.